Man has been sending astronauts and robotically-controlled probes into the dark depths of space for over half a century, but what happens when those two aspects finally collide? The field of android robotics is advancing faster than ever and it's now using virtual reality to train those extremely expensive robots to function on space stations above the Earth. 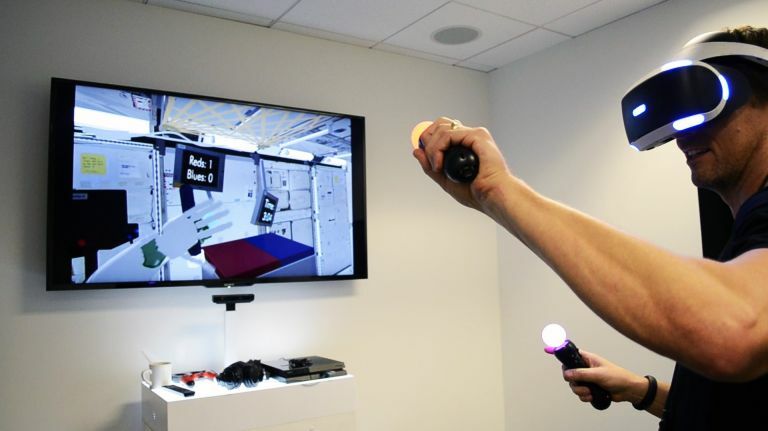 According to a report by Road To VR, a partnerships has been struck between NASA and gaming and electronics giant Sony that will see its soon-to-be-released PlayStation VR tech (formerly Project Morpheus) used to create a new piece of software that simulates an android working in space. The program, Mighty Morphenaut (which might win an award for the best Power Ranger name ever) essentially recreates a small shuttle and enables engineers to control a simulated android using the PSVR headset and one or more PlayStation Move controllers. The Mighty Morpenaut demo, which runs on Sony's equally mighty PlayStation 4 console, has also been designed to compensate for the inevitable lag you'd get from operating a space-based android all the from Mission Control. The software uses a 'ghost hands' feature that enables the operator to make a gesture that the robot will then imitate a short time later. This controlled and predicted gap means said operator can eventually adapt to the delay, although how such a gap will affect its use in real-life scenarios is clearly a bit of grey area at the moment.